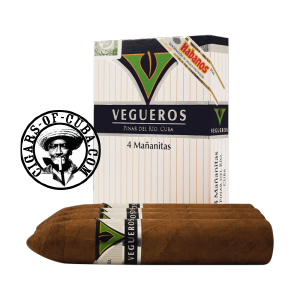 Habanos has re-vamped the Vegueros brand. A lifting that includes a re-worked blend, a new logo and a new tin packaging of 16 cigars. The blend is more powerful than the original Vegueros vitoles but we still find the grassiness, so familiar to this brand. The Petit Piramides is currently a very popular size for producers and smokers alike. The Mañanitas falls in the Montecristo Open Regata category, offering a relaxingly mild tobacco smoke that focuses on flavor, rather than power. Superb construction with a golden brown wrapper, this small Cuban should be in your humidor at all times. Habanos has re-vamped the Vegueros brand. A lifting that includes a re-worked blend, a new logo and a new tin packaging of 16 cigars. The blend is more powerful than the original Vegueros vitoles but we still find the grassiness, so familiar to this brand. A relaxingly mild tobacco smoke that focuses on flavor, rather than power. A Summer classic or simply a lighter change to your regular, more powerful smoke.